Rodding USA Issue #3 is sold out but there's still some copies at our dealers retail stores. Check here for a list of locations: http://www.roddingusa.com/index.php/buy/retail-outlets or call Paul Martinez on 520 444 5603. Rodding USA's Issue #3 is Sold Out. 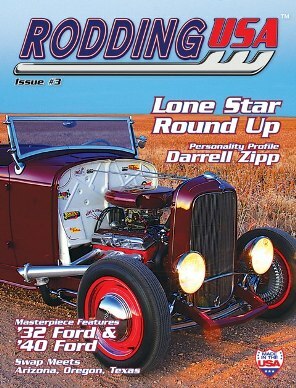 Our third edition of Rodding USA magazine features two masterpiece features. First up is Don Kirk's custom '40 Ford coupe while the second reveals Gary Vahling's deuce roadster. Those are backed by an additional four hot rod features plus four special interest features which includes a Personality Profile on hot rod industry icon Darrell Zipp. We also take a look inside Ron William's hot rod garage for a peek inside at something special. Our event coverage features an extensive (14-page) feature on the Lone Star Roundup held just a few weeks ago plus coverage of the Portland Roadster Show plus three swapmeets from across America. If you're into doing it yourself then check out our Tech features too! We' got a product showcase and much more. Issue #3 is sold out but there's still some copies at our dealers retail stores. Check here for a list of locations or call Paul Martinez on 520 444 5603: Rodding USA…by hot rodders, for hot rodders.